An installation must consider the reality of the existing electrical equipment, elec calc™ is thus enriched of multi-manufacturers database of equipment and cables. 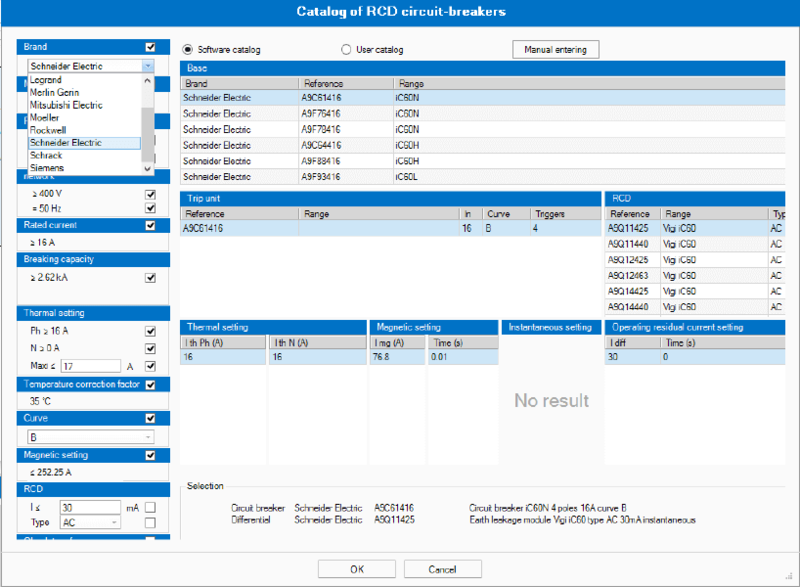 According to the result of the calculations and constraints imposed by the user, elec calc™ offers a range of references from which the user chooses the most appropriate. The availibility of the manufacturers’ catalogues is a permanent process to insure to our users to arrange of updated references and to allow to the highest number of manufacturers to be present in elec calc™. The annual subscription allows to benefit from the different updates throughout the use of your software. It allows you to download the new versions and updates of catalogs on the users support area. You are informed of the availability of a new version via your software or new data in regard to electrical equipment.